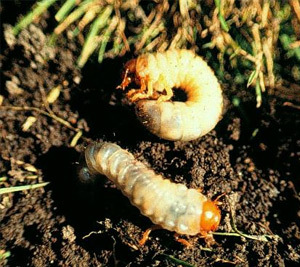 White grubs are the larvae of the June bug or May beetle. The beetle varies from brown to black in color, and from ½ to 1 inch in length. Most species have a life cycle of three years, but some complete theirs in one year and others in four years. The adult beetles emerge from the soil in the spring. They feed on the leaves of various kinds of trees at night and return to the soil during day. The eggs are usually laid in grassy sods. These eggs hatch into larvae in a short time. The white grubs feed on the underground parts of various plants, but white grubs prefer grasses. Injury is often sufficiently severe for patches or even large areas of grass in pastures or meadows to be completely destroyed. If the dry patches of dead grass are lifted or rolled up, numerous white grubs will be found in the soil. In addition to grasses, potatoes, strawberries, and some garden crops are sometimes injured severely by white grubs. The white grub is a stout, white worm or grub about ½ inch long. Its head and legs are brown in color. The insect spends the first, second, and most of the third year in the larval stage. During the winters preceding the second and third year, it hibernates beneath the frost line in the soil. It pupates in the late summer of the third year and emerges as an adult beetle in the fall. The beetle spends the winter below the frost line in the soil and emerges the following spring to lay its eggs and complete its life cycle. The white grubs damage the tubers by eating holes in them. If infestations are severe, large numbers of the tubers are damaged to the point where they are unfit for marketing. How to control white grubs of insect potato? Treatment with one of the chemicals recommended for wireworms will provide satisfactory control against light or moderate infestations of white grubs of insect potato. Good cultural and management practices are also helpful control measures. Inasmuch as the beetles lay most of their eggs in grassy sods, potatoes should not follow them, especially I years when infestations of beetles are heavy. Sweet clover, alfalfa, and medium red clover have the effect of repelling the beetles. Consequently, the use of these legumes during years of heavy flights will reduce the number of eggs that will be laid by the beetles on areas occupied by them. Likewise, the use of cultivated crops during such years has a tendency to have the same effect. Plowing in late summer or early fall during the third year of the life cycle of the insect when it is in the pupa stage will destroy many of them. Late plowing, however, is ineffective inasmuch as the pupae have changed to adults beetle and have burrowed their way below the plow layer by that time. Poultry and hogs consume many grubs when they graze areas infested by them, and large numbers are destroyed by birds, especially when they are turned up at the time of plowing. 0 Response to "Control white grubs of insect potato"